The team at Shred Wise Inc. is standing by seven days a week to help you with your document destruction needs in Laguna Hills, Laguna Niguel, and Laguna Woods. Whether you have just a few boxes of confidential files or regularly produce large quantities of sensitive documents, we will be able to design a cost-effective shredding program to help you securely dispose of them. We serve both residential and commercial clients throughout Laguna Hills and provide them with paper shredding services that are not only competitively priced, but also compliant with today’s privacy legislation, including HIPAA (Health Insurance Portability and Accountability Act), FACTA (Fair and Accurate Credit Transactions Act), and GLBA (Gramm-Leach-Bliley Act). 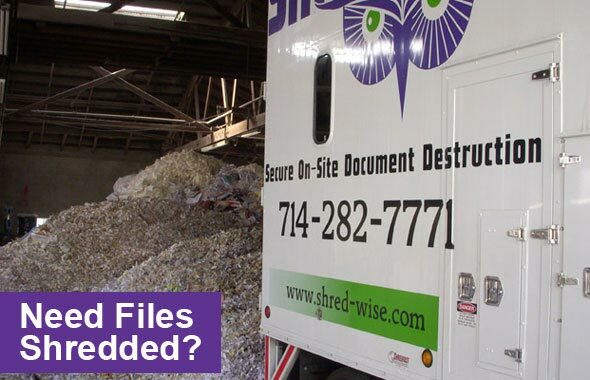 Since 2006, Shred Wise has helped thousands of satisfied clients from Laguna Hills and other Orange County cities securely destroy their sensitive documents and files. Our clients have included individuals, families, doctors, dentists, hospitals, clinics, convalescent homes, insurance companies, attorneys, tax firms, accountants, banks, schools, government agencies, real estate companies, mortgage companies, and more. They know that by working with us, they will always receive efficient, cost-effective, and reliable document destruction and work with friendly, professional, and trustworthy staff who are thoroughly familiar with the information destruction industry’s best practices. 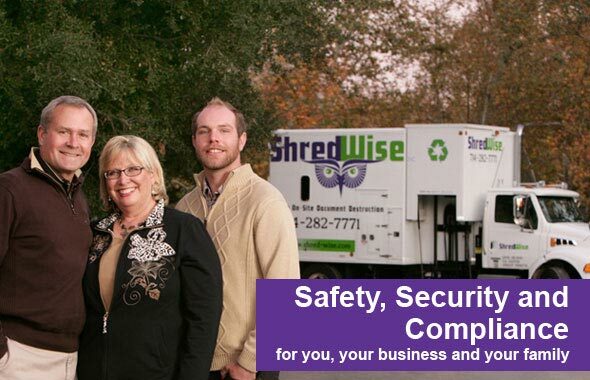 Call Shred Wise today at (714) 282-7771 for a free estimate, to schedule service, or just to learn more. We guarantee that everything we shred will be 100% destroyed and recycled. We are licensed, insured, and bonded, and follow the industry’s best practices set forth by NAID (the National Association for Information Destruction). Additionally, with Shred Wise, our Laguna Hills, Laguna Niguel, and Laguna Woods clients will always talk with a staff member who is knowledgeable in all aspects of information destruction and the requirements of current privacy legislation. If you are interested in one-time or ongoing paper shredding services in Laguna Hills, Laguna Woods, and Laguna Niguel, give us a call today. Quotes can be provided over the phone with an accurate description or by sending us a photo of what you need shredded. To meet the needs of individuals as well as businesses of every size and type in Laguna Hills, Shred Wise offers customizable and flexible shredding services. Our clients can choose to bring their boxes of papers to our facility in Orange; schedule a secure pick up to have their documents shredded off site; or schedule on-site shredding for a one-time purge or ongoing needs. We can often accommodate requests for same-day or next-day service, as well as requests for additional visits between regularly scheduled services. Many of our commercial clients also appreciate that our service agreements are essentially month to month, which means they can try out our mobile shredding services with little to no risk. Call today to learn more. Personalized mail – benefit summaries, credit card offers, invoices, junk mail, and more. Of course, any and all paper with two or more pieces of identifiable personal information on it should be shredded. Personal information that should be protected includes your name, address, phone number, social security number, date of birth, driver’s license information, account information, and more. Having been victims of identify fraud ourselves, we feel that you can never be too careful. To learn more, give us a call. We are happy to review with you what documents you should be shredding in Laguna Hills, Laguna Niguel, and Laguna Woods. For commercial clients in Laguna Hills, Laguna Niguel, and Laguna Woods who routinely work with or produce large quantities of sensitive information, we provide convenient and cost-effective on-site shredding services. On-site shredding (also called mobile shredding) is shredding that is done right in front of your place of business and includes secure pick-up by our carefully vetted, uniformed staff; the ability to witness your documents being shredded curbside or on our onboard shred cam; and 100% recycling of all your shredded paper. For regularly scheduled on-site shredding services, we also provide our clients with locked shred containers at no additional cost. At the conclusion of each shred visit, we always issue a Certificate of Destruction for your records. When on-site shredding is scheduled for a one-time visit to purge numerous boxes or even pallets of confidential documents, this service can be a great value for residential and commercial clients alike. Call us today for a free estimate and to schedule service. Mobile shredding services are available Monday through Friday. In addition to on-site shredding services, we also provide businesses and individuals in Laguna Hills, Laguna Niguel & Laguna Woods with off-site shredding services. They can either bring a few boxes to our facility located at 3222 East Chapman Avenue in Orange, or have us send out a secure panel truck to pick up your boxes of paper and files. In every scenario, we guarantee that your documents will be 100% destroyed and recycled, and provide you with a Certificate of Destruction when we are done. With our flexible and customizable shredding services in Laguna Hills, you will be able to schedule service as little or as often as you need. We offer one-time visits for those who are cleaning out their files, garages, or storage units, as well as regularly scheduled visits for those who need ongoing shredding services. Laguna Hills businesses can sign up for ongoing shredding services on a weekly, bi-weekly, monthly, bi-monthly, or quarterly basis without having to worry about being locked into a long-term contract. Instead, we use a simple agreement form with straightforward language that confirms the frequency of our on-site shredding visits; the rate of our service; the use of our security containers for the duration of the agreement; and the need for 30 days’ advance notice if you need to end our services. Our ongoing, scheduled shredding services are designed to be very flexible, so they can readily meet the varied and sometimes unpredictable needs of our valued clients in Laguna Hills, Laguna Woods, and Laguna Niguel. Alternatively, individuals and business owners can simply schedule mobile shredding services when they need them, and we will always do our best to accommodate their requests in a timely manner. 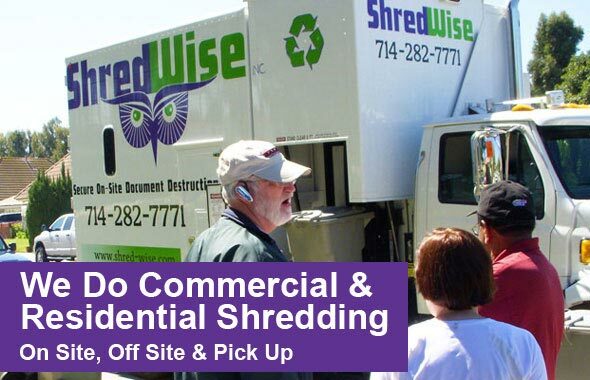 To comply with privacy laws requirements and to offer shredding services our Laguna Hills and Laguna Niguel clients can trust, Shred Wise Inc. uses the most secure commercial shred trucks available in the industry and complements them with secure shred containers. Our shred trucks can go on most roads, shred up to 6,000 pounds of paper per hour, and automatically lift and feed shred containers into the shredding area. Clients can watch the truck as it lifts each shred bin and view our onboard shred cam to see the paper get shredded inside the truck. Our trucks use pierce and tear technology that is extremely effective in destroying paper items with minimal dust. We also have a large inventory of locked shred containers. Our Laguna Hills and Laguna Niguel clients can opt for either our large rolling bins or our professional office consoles. Both of these containers are lockable, so you can store your confidential documents securely until they are scheduled to be shredded. These shred trucks, bins, and consoles meet current privacy law requirements and, when strategically placed, encourage your employees to properly dispose of sensitive information.